I bought my first DSLR, Canon's original Rebel (300D) with the kit zoom lens (18-55mm) and the thrifty fifty (50mm f1.8). A couple of weeks later I sourced the 28-105 f3.5-4.5 secondhand from CraigsList for $140. Street price, new is a little over double that but even at this price it is far from expensive. For a long time it was my main lens but I then got the 28-135mm IS and my old faithful 28-105mm got relegated to the bottom of the camera bag. Recently my wife has purloined the my favorite IS lens so I have had chance to get reacquainted with the old 28-105mm. This lens is one step up from the real budget lenses but a good notch below anything with an 'L' designation. This puts it above beginner but below pro-class lenses. It has a metal lens mount, focusing scale, the front element doesn't move while focusing and there's a full time focus ring which are all higher-end features. It feels more solid than a starter lens but not as rugged as an 'L' lens. On the down side, the aperture isn't constant and the lens grows longer when you zoom out. On the camera it is light without feeling delicate. The zoom is relatively smooth and the focusing is pretty fast. The optics are good; image quality is the same as my from my 28-135mm IS but not as good as my friend's 24-105mm L, obviously. There's a little distortion at the extremes of the zoom range but it is manageable. Likewise, chromatic aberrations are what you'd expect for the money. 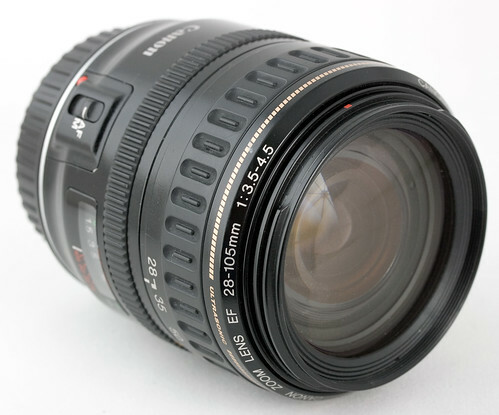 On a crop factor DSLR the zoom range is equivalent to an unusual, but useful 45-168mm. This makes for a pretty good walkabout lens. It's not going to inspire you with it's lens gymnastics and super sharpness but it doesn't have many flaws to get in the way and hinder you either. It's a no nonsense, affordable, quality lens well worth your consideration if, like me, you have to live to a budget and you're looking for value. Returning to this lens after some time away I am impressed by its compactness and quality but I do miss the stabilization from my 28-135mm and, if I had the money I would buy the 24-105mm IS L. The the 28-105mm is a compromise, but it is a compromise I can live with ... for a while at least.